The Center of Automotive Management (CAM) has published its latest study on electromobility in an international comparison. 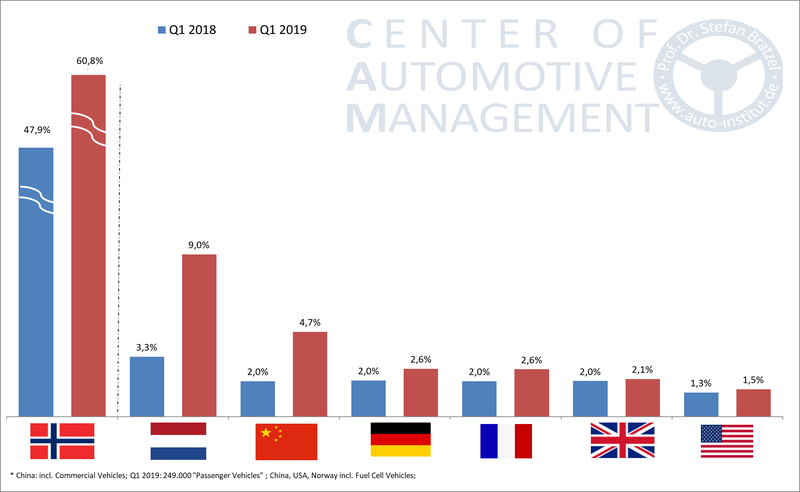 E-vehicles therefore showed a high level of dynamism in the first quarter of 2019 in the overall automotive market, which was falling overall. China and Norway will continue to be the drivers of e-mobility in the new year as well. In China, the demand for electric vehicles with connectors (BEV & PHEV) more than doubled in the first quarter of 2019, according to the CAM. The overall market including commercial vehicles fell by 11 percent (only cars: -14%). E-Sales increased to 299,000 vehicles in the first three months compared to the previous year, including 249,000 cars. The market share of e-cars for new car registrations in China has increased from 2.0 to 4.7 percent, about 80 percent of them are pure electric vehicles (BEV). 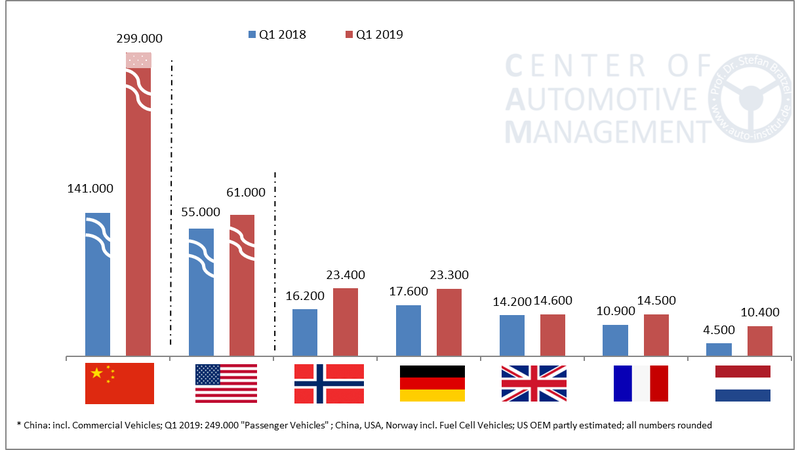 In Norway, the market share of electric vehicles in the first quarter of 2019 according to the figures of the CAM to a record of now 61 percent of new registrations (Q1 2018: 48%). With 23,405 electric vehicles, an increase of 45 percent was achieved. The proportion of purely electric models rose to nearly 50 percent, while new registrations of plug-in hybrids (PHEV) dropped significantly. According to sales figures, the second largest e-vehicle market remains the USA, reports the CAM. New registrations in the first quarter of 2019 rose moderately by 11 percent to 61,000 e-vehicles. While sales of PHEVs eased, BEVs were able to sell their share to around two-thirds of e-vehicle sales. The market share of e-vehicles rose in a declining overall market from 1.3 to 1.5 percent of new registrations and thus remains at a low level in international comparison. The market leader is by far the electric car manufacturer Tesla, which accounts for around half of the e-vehicle sales in the USA. The German automobile market stagnated recently (+0.2%), but e-vehicles were able to increase significantly. For the first quarter of 2019, the CAM has increased by 33 percent to 23,300 newly registered electric vehicles (Q1 2018: 17,600). The market share rose from 2.0 to 2.6 percent. With around 15,900 BEVs in the last three months, sales of pure electric vehicles in Germany have increased by 75 percent, while plug-in hybrids have dropped by 13 percent to just 7,400. The best-selling e-car was recently the Tesla Model 3 with 3200 units followed by the Renault ZOE with 2700 and BMW's i3 with nearly 2000 units sold. In the United Kingdom, the momentum of e-vehicle sales in a declining overall market (-2.4%) was last low: In the first quarter of 2019, there was an increase of 2.8 percent to 14,600 units, according to the CAM. The market share rose slightly from 2.0 to 2.1 percent. In France, new e-car registrations increased to 14,500 passenger cars in the first quarter of 2019 (+ 33%). Thus, the market share rose to 2.6 percent (2018 Q1: 2.0%). BEVs accounted for about 73 percent of electric sales, plug-in hybrids 27 percent. The Dutch market was particularly dynamic, with sales of electric vehicles increasing by 132 percent to 10,400 units in a sharply declining overall market (-14.4 percent). The market share rose from 3.3 to 9.0 percent. BEVs came with 83 percent on a high proportion of the e-vehicle registrations. "Electric mobility is about to make its breakthrough in the central automotive markets, but we expect this from 2020 onwards. It is striking that e-vehicle sales are already able to tackle a generally declining overall market. The dynamics are based on the pure electric vehicles, while the sales of plug-in hybrids is currently declining, "commented study leader Stefan Bratzel the results of the recent CAM analysis.